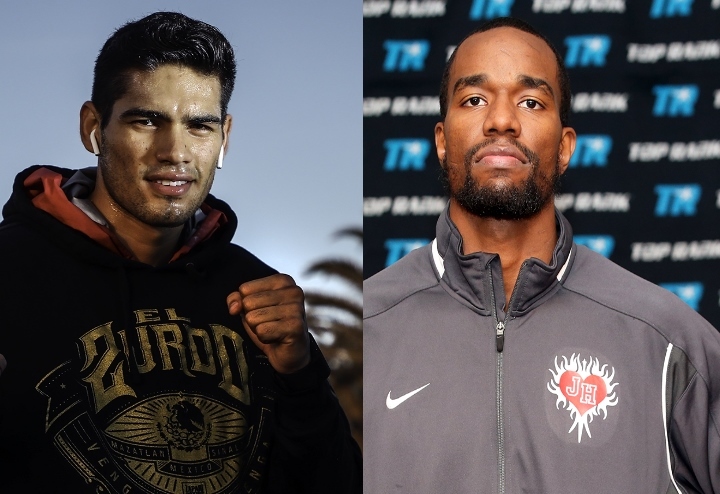 Hart: I'll Trade With Gilberto Ramirez, He Got No KOs Since 2014! #1 rated WBO super middleweight Jesse "Hard Work" Hart (22-0) will be in the biggest fight of his career when he steps in the ring against Gilberto "Zurdo" Ramirez (35-0) on September 22nd in Tucson, Arizona. The fight will be televised by ESPN along with Oscar Valdez's (22-0) WBO featherweight title defense against Genesis Servania (29-0). Ramirez's trainer Hector Zapari recently told BoxingScene.com that they hope Jesse Hart will man up and fight and not run from Ramirez the way that Max Bursak did in their April fight. The unbeaten Hart found those comments amusing and said that his power is far superior to Ramirez. He pointed out that Ramirez's last five opponents have all gone the distance. Hart said that he plans on fighting a smart fight and doesn't believe that Ramirez's team really wants a toe-to-toe fight. "I am going to do everything it takes to win. You can't tell me to stand and fight. I am going to do a little bit of everything. If they want to fight them I will give them a fight. If they want to box then we will box. On September 22nd he is not going to be able to do nothing. That world title is coming home with me. They know they can't win," said Hart. "Like I said, there only hope is that I stand there and bang but I can beat you at that too. His defense is not better than mine. His punching power - he don't really have no power to get me out of there. I am not really afraid of going in there and trading with him. He doesn't pose no threat. Again I reiterate, he hasn't had a knockout since 2014. So me worrying about his power is no issue. It is no issue. He can't hurt me and his trainer knows that. He talk about he want to bang but they know I got that power for real. Y'all know that I got power and when I hit people they do funny dances. They do something to make it known that this boy is hitting and that he isn't joking around. He is hitting for real for real. Like I said, to say they want to bang when the kid hasn't had a knockout since 2014, c'mon man." The fight card will be the fourth under the new arrangement Top Rank has with ESPN. The plan is for an even busier 2018 on the World Wide Leader. Hart likes the fact that his fights will be available to a much a wider viewer audience than his previous fights. "Man I think its wonderful what Bob Arum, (Top Rank VP) Carl Moretti and Top Rank are doing with ESPN. I think its beautiful. It's about time that the people get to see the fights on ESPN because for a long time it was on HBO and that is all we had for the big fights. I think on ESPN they will do way more numbers and get more views than HBO. Not saying anything is wrong with HBO but I just think the views will me much more spectacular. Everybody tunes in to ESPN for all sports while boxing was just on HBO. HBO did a few sports segments but ESPN is sports all day long and I think that is a huge deal. Everyone tunes into ESPN to watch all sports. That is why it is good to be on ESPN," Hart told BoxingScene.com. Don't know much about Hart but his record isn't telling me much, I have to go with Ramirez by decision.